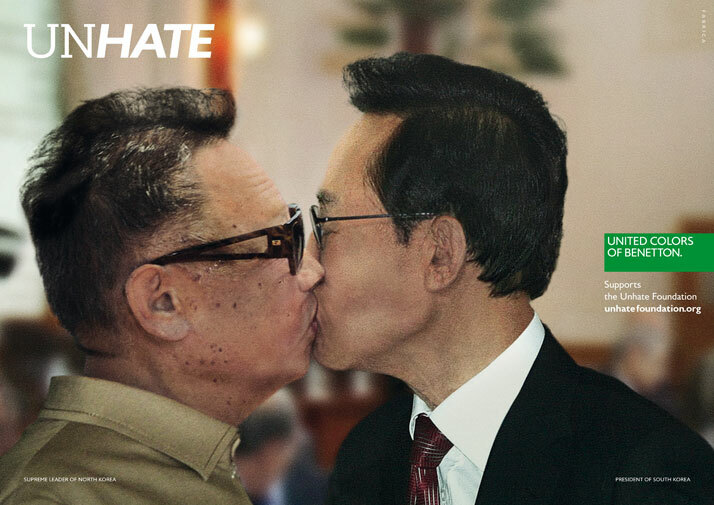 United Colors of Benetton has set up the UNHATE Foundation urging the leaders and citizens of the world to combat the “culture of hatred” with a simple gesture. 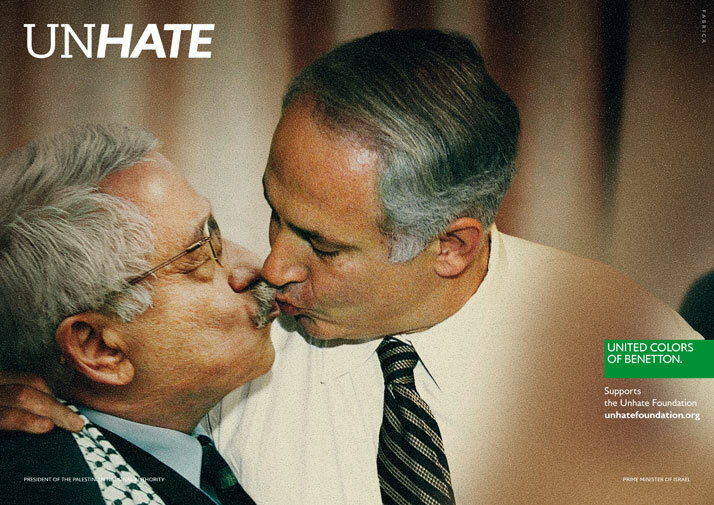 Controversies have been steaming up presidents and religious leaders began sharing kisses with each other. 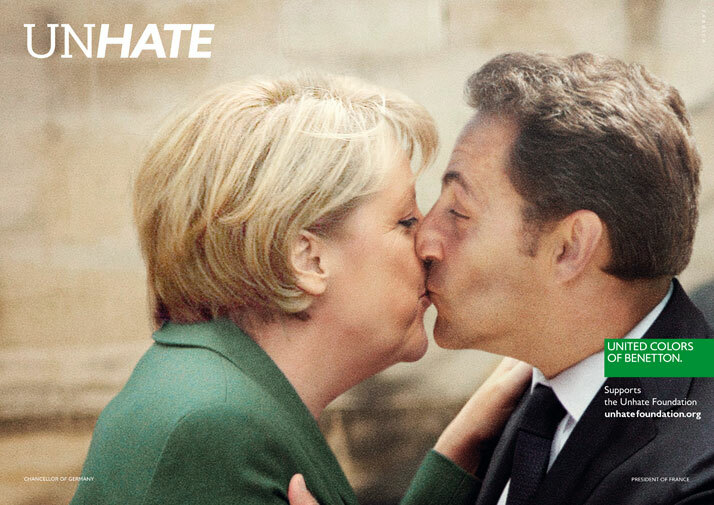 The new worldwide communication campaign crew explained that the idea behind the kiss is to constructively provoke and stimulate reflections on politics and faith. “Hatred is never appeased by hatred in this world. By non-hatred alone is hatred appeased.” This profound and humane concept of tolerance sums up the principles inspiring the UNHATE campaign, which Benetton has created with the aim of contrasting the culture of hatred and promoting closeness between people, faiths, cultures, and the peaceful understanding of each other’s motivations, using a global call to action and the latest communication tools. The leaders featured in the campaign are Barack Obama and Chinese leader Hu Jintao; Pope Benedict XVI and Ahmed Mohamed el-Tayeb, Imam of the Al-Azhar Mosque in Cairo; the Palestinian President, Mahmoud Abbas and the Israeli prime minister, Benjamin Netanyahu. These are symbolic images of reconciliation – with a touch of ironic hope. UNHATE, which is the first initiative by the newly formed foundation of the same name, was presented in a worldwide preview by Alessandro Benetton, Executive Deputy Chairman of Benetton Group, on 16 November in Paris, at the flagship store in Boulevard Haussmann. “While global love is still a utopia, albeit a worthy one, the invitation ‘not to hate’, to combat the ‘culture of hatred’, is an ambitious but realistic objective,” explains Alessandro Benetton. “At this moment in history, so full of major upheavals and equally large hopes, we have decided, through this campaign, to give widespread visibility to an ideal notion of tolerance and invite the citizens of every country to reflect on how hatred arises particularly from fear of ‘the other’ and of what is unfamiliar to us,” he said. The new campaign aims to drive the desire for participation and change that animates the world’s citizens, and especially the young, inviting them to play an active, central role in its initiatives, particularly through the Internet, social media and other digital applications. The Unhate is a message that invites us to consider that hate and love are not as far away from each other as we think. Actually, the two opposing sentiments are often in a delicate and unstable balance.